Curse those lousy Manchus. Always burning down Shaolin temples and causing havoc. When will they ever learn? Five Shaolin Masters follows the very game efforts by surviving members of the temple ambush to mobilize a fighting force, rout out likely traitors to the cause and take out as many Manchu fighters as humanly (or inhumanly) possible. Monk loyalty is confirmed with a hand signal based on Emperor Ming’s birthday, 319 (basically the letter “F” from American Sign Language). Disloyalty is seemingly represented by facial hair. 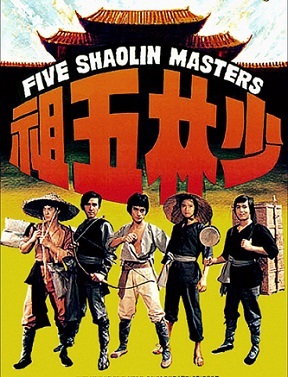 Five Shaolin Masters is a Shaw Brothers production, directed by Hong Kong action legend, “The Godfather of Hong Kong cinema,” Chang Cheh (Five Deadly Venoms). He brings the ruckus and gives the foley artist a big workout in countless fight scenes, a memorable one being two “government men” getting their noggins knocked together in a restaurant. There’s also a Manchu goon beaten down with a wooden bench. The film’s also known as Five Masters of Death and features a very brief cameo by the legendary Gordon Liu (Kill Bill), who unfortunately isn’t one of those masters and gets the business end of a spear by Manchu fighters in an alley. Spoiler alert. No matter. Four years after this film’s release, he went on to tackle all 35 chambers and even start his own in The 36th Chambers of Shaolin [Check out our 36th Chambers podcast]. In Five Shaolin Masters, discretion is frequently the better part of valor as the rebels frequently flee into the hills to live to kill a Manchu another day. Sure, some are reprimanded for doing just that and not joining fellow patriots to raise the body count, but it heightens the realism. What else is needed? The five primary patriots/rebels know their limitations, so they go back to the temple to brush up on Shaolin kung fu techniques like Pole Technique, Cross Style, and Whipping. This one’s action-packed with rock ’em, chop sock ’em flare. It’s the Shaw Brothers. We expect nothing less. This entry was posted in Action Films and tagged 70s movies, martial arts, movies filmed in Asia by Really Awful Movies. Bookmark the permalink. Yes. Yes. More yes. Shaw Brothers rule. Haven’t seen this one in years. Might need to revisit. Thanks for bringing this part of my childhood back.